Last Monday, the Trump Administration announced that it would designate the Iranian Revolutionary Guard Corps a ‘terrorist organization’ a move that owned the US President the praise of Israeli Prime Minister Binyamin Netanyahu only, like reported by inn.com. “Thank you for answering another one of my important requests, which serves the interests of our country and the countries of the region,” Netanyahu wrote in a Tweet. Iran predictably condemned the decision and started to threaten US forces in the Middle East and beyond. The Iranian regime considers the move by Trump an attack on Iran and responded by designating the US Central Command in the Middle East (CENTCOM) a ‘terrorist organization’. IRGC commander Mohammad Ali Jafari said US forces would no longer “enjoy today’s peace’ an indication a direct confrontation between the IRGC and the US army has now become a real possibility. The Quds Force of the IRGC, the division tasked with exporting the Islamic Revolution, is responsible for the death of 600 US soldiers during the American occupation of Iraq and is currently supporting terrorist groups throughout the Middle East. “The IRGC will flatten Tel Aviv,” the cleric told Iranians after mandatory Friday prayers while adding that Khamenei has already permitted the coming strike. Iran’s so-called ‘moderate’ president Hassan Rouhani also issued a threat against the US and claimed that the United States was the world’s leading sponsor of terrorism. “You are at the top of terrorism in the entire world.” Rouhani was quoted as saying while the Iranian leader claimed Iran is now in the possession of missiles which are “beyond the imagination” of the Americans. “You know that we have developed missiles since last year until this year that are beyond your imagination,” Rouhani charged. Trump has “made a big mistake by putting IRGC on its terror list and has sacrificed the interests of American people and others across the world for the interests of a host of Zionists,” the Iranian president said referring to Israel. If we take a look at recent events we will see that the Iranians are lying about their belligerent activities and that Trump did the right thing when he upped the pressure on Iran by designating the IRGC a terrorist organization. In Syria, for example, the Iranians continue to build-up a large Shiite-only force which one day will try to ‘liberate’ the Golan Heights and which will be equipped with sophisticated weapons. Israel’s air force IAF just carried out a new airstrike against an Iranian missile plant in the vicinity of Masyaf in the Hama Province in Syria. The IAF warplanes flew at low altitude and used Lebanese airspace to target the Iranian facility with brand-new supersonic Rampage missiles. Satellite images released by the Israeli firm ImageSat International revealed that the new air-to-surface missiles completely destroyed the complex while media reported that a number of Iranians had been wounded and killed by the IAF. Intel Times in Israel, furthermore, revealed that the IAF strike destroyed dozens of Iranian ‘Earthquake 2’ missiles which are able to carry a warhead of 500 kilograms. According to the Israeli intelligence site, Iran recently also delivered weapons to a military airbase in Tifur, Syria a move that didn’t trigger an Israeli response. Iran, furthermore, has succeeded in leasing a port in the Latakia Province at the Mediterranean Sea in Syria and the IRGC, as well as the IRGC-linked Basij militia, have already started to use the port. Experts think that Iran will now transfer a part of its fleet to Latakia and will use the vessels in a future war with Israel. Then there is Iraq, where Iran has formed a 100,000 men-strong predominantly Shiite fighting force called Hashd al-Shaabi which is now threatening Iraqi security forces in the city of Mosul close to the Iranian border. Hashd al-Shaabi is trying to take over northern Iraq to allow the completion of Iran’s land bridge to the Golan Heights and the Mediterranean Sea. The Iranian proxy is also working inside Iran where it officially is providing assistance to Iranian forces which try to help the population after devastating floods killed at least 76 people and drove more than 220,000 people from their homes. Iranian civilians, however, say that Hashd al-Shaabi is in Iran assisting the Basij militia to quell new unrest among the population after the regime in Tehran failed to provide the necessary relief to flood victims. In Yemen, meanwhile, Iran is trying to frustrate a fragile ceasefire between its proxy Ansar Allah (commonly referred to as Houthis by the media) and the central government. Iran has a vested interest in a victory of Ansar Allah because it aims to encircle its nemesis Saudi-Arabia as part of a plan to invade the Kingdom and to take over the Muslim holy places in the country. A Houthi victory would, furthermore, enable Iran to control the strategically important Bab al-Mandeb strait where a significant part of the West’s oil passes through. Iranian control over the narrow waterway could threaten shipping lanes in the Red Sea and choke off Egypt and Israel. In reaction to the increasing American pressure, Iran also appears to be restarting weapons-grade uranium enrichment. The regime “authorized and begun spinning a set of advanced nuclear centrifuges to mark the country’s Iran National Nuclear Day, which leaders said is in honor of all the ‘jihadi efforts’ of our country’s nuclear industrialists,” according to Washington Free Beacon reporter Adam Kredo. The Mullahs have authorized the use of a set of 20 advanced IR-6 centrifuges which are used to produce weapons-grade uranium, Kredo reported. Today, we launched a chain of 20 IR-6 centrifuges,” Rouhani said during the inauguration. “If you persevere in your injustice and wrongdoing, you will also see a chain of IR-8 centrifuges in the not-so-distant future. You cannot prevent the scientific progress of the Iranian people,” the Iranian leader warned. This “scientific progress” could mean that Iran is in breach of the JCPOA, the nuclear deal between the Islamic Republic and five world powers. Fox News reporter James Rosen says he has evidence Iran is still exploring nuclear weapons. 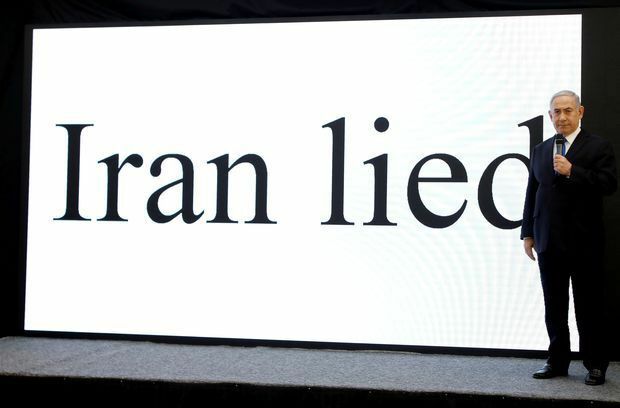 Rosen found that the massive nuclear archive the Israeli spy agency Mossad stole in Iran contained material documenting a massive underground complex near the military base Parchin which the Iranians refused to open-up for inspections by the International Atom Energy Agency (IAEA). The underground Shahid Boroujerdi project was built in 2002 and 2003 and according to former IAEA inspector David Albright should have been declared and inspected under the JCPOA. Albright is convinced that the discovery of the Boroujerdi tunnel complex means that Iran is currently not complying with the JCPOA as the IAEA claims.